Through the looking glass of bauhaus principles, observing the elements of “poetry” and how that guides new possibilities in the making of a poem. 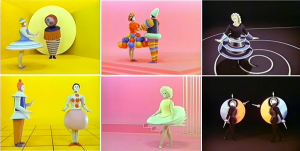 What inspires me to explore this idea is the incredible visuals of Bauhaus Theatre. More spesifically HOW the concrete, minimalistic and practical demeanours of Bauhaus (which in my mind have such an adult attitude!) 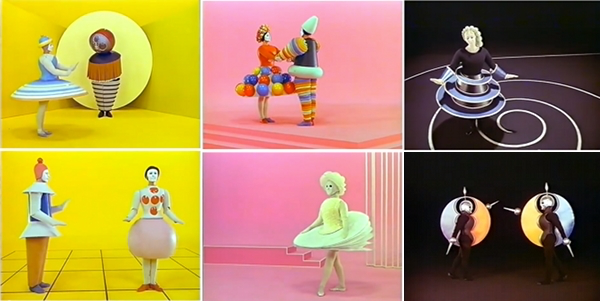 created such extravagant, playful, toy-ish costumes that look like perhaps a child puked them out of their wild imagination! While “the bauhaus element” in these costumes is undeniably present to me, there I observe something more, almost an added element… Having read that the thinking behind the designing of these costumes is in fact by observing the performers body with a calculating attention and following its relations to the space(the stage) through its motion*, I am tempted to think this “other element” I was looking for might just be the ballet itself. Assumption….. The designs of these costumes are just materializations of the visuals the dance draws in the viewers mind-eye. 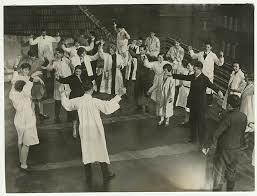 The dance is numerous invisible lines and shapes drawn in time with the tool of the body… Perhaps! Bauhaus building within an existing art form alters its outcome. So It makes me Wonder. How would it apply to poetry? With letters and words as form and rhythm and sound as dance, the paper as the stage. I found myself wondering this more so than other mediums mainly because I haven’t seen it attempted. A concrete definition: Poetry is a form of literature that uses aesthetic and rhythmic qualities of language to evoke a concentrated imaginative awareness of experience or a specific emotional response. Here is a new world, with its new forms and movements, sensations and images, to build a new Bauhaus in and of it. 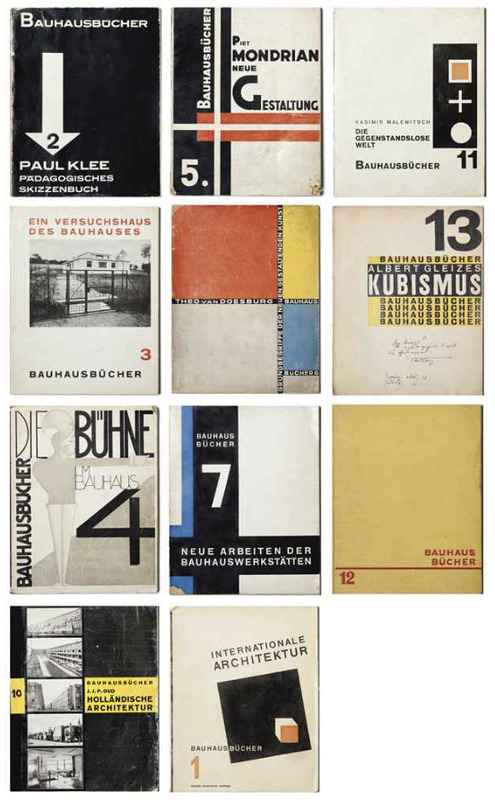 I will attempt to look at some elements of poetry and seek new possibilities in its design, looking at it through the 5 characteristics of the Bauhaus design. It means that in design, a form should always be applied because of its function instead of its aesthetic appeal. “Utility came first and excessive ornamentations were avoided.” The thing is that this principle seems to shift slightly when applied to an already existing art form like dance, or poetry, as the means of actions in these are the adornments themselves. So, thinking of function for aesthetic, rhythm, imagination and emotion (and so on…) is altogether a different approach. 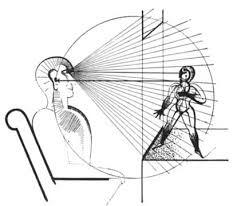 Function in this case, I imagine, would be to ease and support the already existing or suggested communication of forms and elements -in the case of poetry, for example,——: All aspects must serve to communicate/highlight the emotion/mental picture/phoneasthetic situation. Letters (uppercase, capital;size;font;color;bold-italic…so on. ), Words, Gaps, Marks, etc. + the plane the poem will be viewed on should be used for this, courageously. 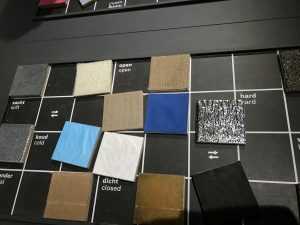 According to the teachers at Bauhaus, materials should reflect the true nature of objects and buildings. This to me, follows up to the previous case. What are the true materials of text, literature and what are their functions? These are not meant to be hidden, but even highlighted to show their functions thus exaggerating and complementing the existing literary pleasure. In bauhaus theatre we see the stage too, is designed in such a way that it holds hands with the costumes designed to exist with it, so the form and its space exist as one self-complimentary relation. I believe this relation is somewhat weak in the current poetry. There is perhaps much to do to enrich our poems by putting more thought on the plane (usually the regular white paper) we present it on. I would advise seeking new possibilities on this, trying to create a more powerful relation between the elements of the poem and the presentation of it. 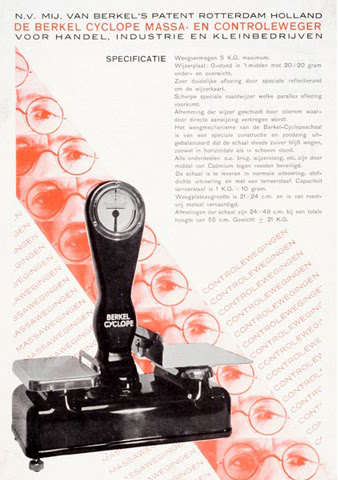 Bauhaus artists favoured linear and geometrical forms, while floral or curvilinear shapes were avoided. Only line, shape and colors mattered. Anything else was unnecessary and could therefore be reduced. Therefore we should give the reader the necessary amount of words (and preferably words that are not too difficult or esoteric) and not more, as it risks tiring the emotional and phonetical landscape. This approach also gives the poem a fresh, modern look, which is desired. It becomes open and approachable artistic experience, instead of possibly exclusionary one. Translated from German as “total work of art”,”ideal work of art”,”universal artwork”*, “synthesis of the arts”, “comprehensive artwork”, “all-embracing art form” or “total artwork”) is a work of art that makes use of all or many art forms or strives to do so. The poem can draw a picture as a visual form, can be sang as a song or acted as a play and so on… all this is desired and should be attempted. *The concept of language makes this difficult as many languages used for poetry cannot be called Universal, but I believe it is still quite possible to challenge this with the help of growing alternative languages, which I will go more in depth in the following. In 1923, Bauhaus organised an exhibition that shifted the Bauhaus ideology. 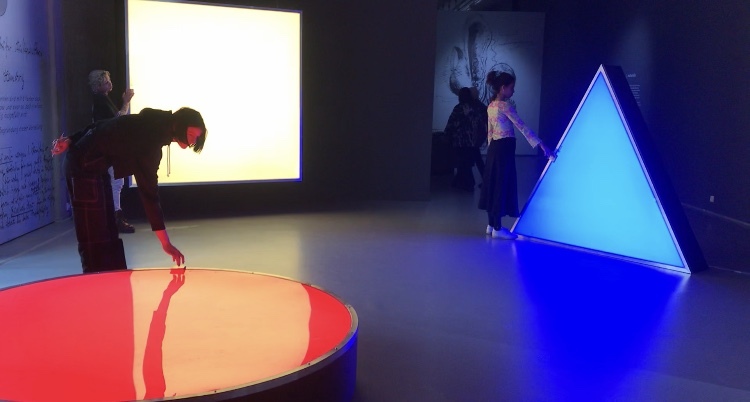 This exhibition was called ‘Art & Technology: A New Unity’. From then on, there was a new emphasises on technology. The artists embraced the new possibilities of modern technologies, for example at the time, mass-producibility was keep in mind whilst designing a product. New technologies today, gave us new languages to play and build with for poetry that I do not see being benefited from enough. A prime example of this are the Emojis–a small digital image or icon used to express an idea or emotion. It is, by definition, quite similar to the words that we use but with an advantage of their own, being capable of much more of a universal communication than any word of any language. They are being used so often in our daily texting and us new age kids have learned to communicate so much with them so easily, and with the help of an ever growing selection of emojis available to anyone with a smartphone, I am surprised why they are not being used more creatively. I believe through emojis a new, different and straightforward literary landscape is possible and I would like to attempt it. Everywhere is filled with stars! Is the last statement of Walter Gropius in his Bauhaus Manifesto in 1919. It shows how open minded the school is in this early 20th century, opening the door of the art school to everyone. At this time when women were not admitted in academies, the gender parity was respected at the Bahaus Schule, at it begining. Over the years, the number of admitted women will be considerably reduce. 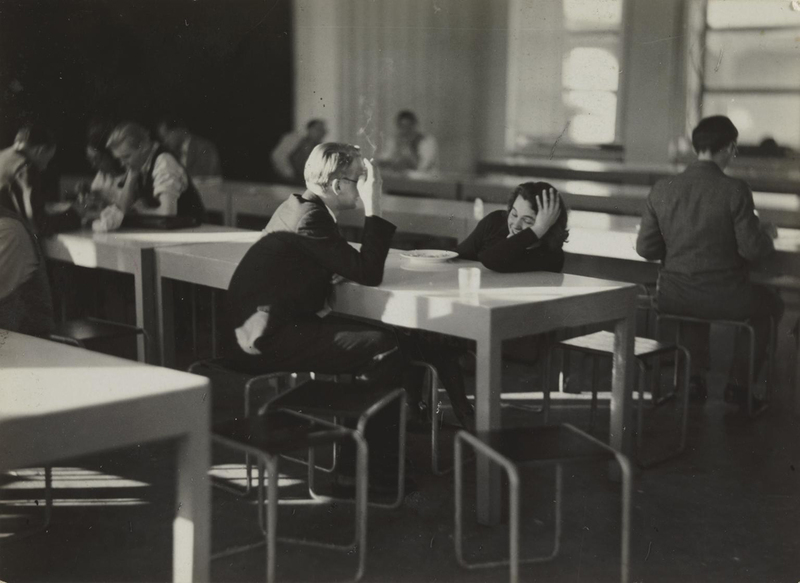 Later on according to Gropius “Men thougth in three dimension while women can only handle two.” Relagated to the backgroung, females students had to figth male hostility to go beyond the textile workshop. Add to that how machiste the legacy of the Bahaus is and I can define females as a minoritie regarding this school. They had to figth to get into the education, then during their study to open doors of different workshop and achieve their goals more then others. Then 100 years later we have to figth for their memory to be inscribed in the Bauhaus heritage. In the Bauhaus book about great figures of the Bauhaus that I borrow in the library, their was nothing about Annie Albers or Marianne Brandts, while both had leadership position in the school. Female work were not respected and is still not. 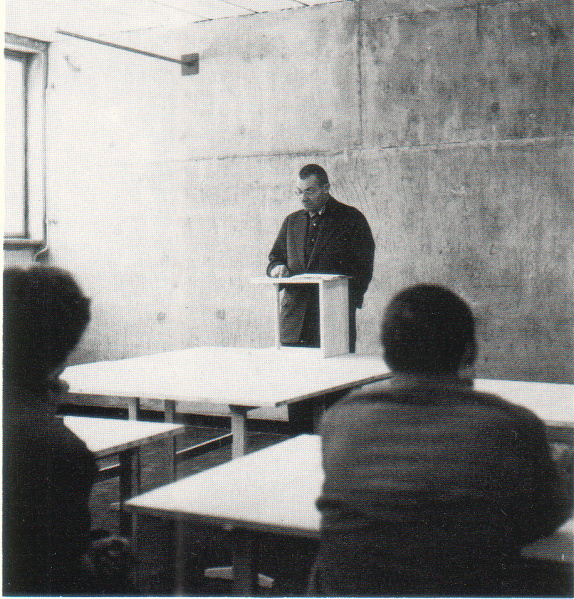 During the power point presentation in class at the Rietveld, still nothing about women’s work or figures. Why do we keep forgetting about them even tho it was such a big change that their were admitted in such studies and they achieved so many great things such as their male co-wokers? 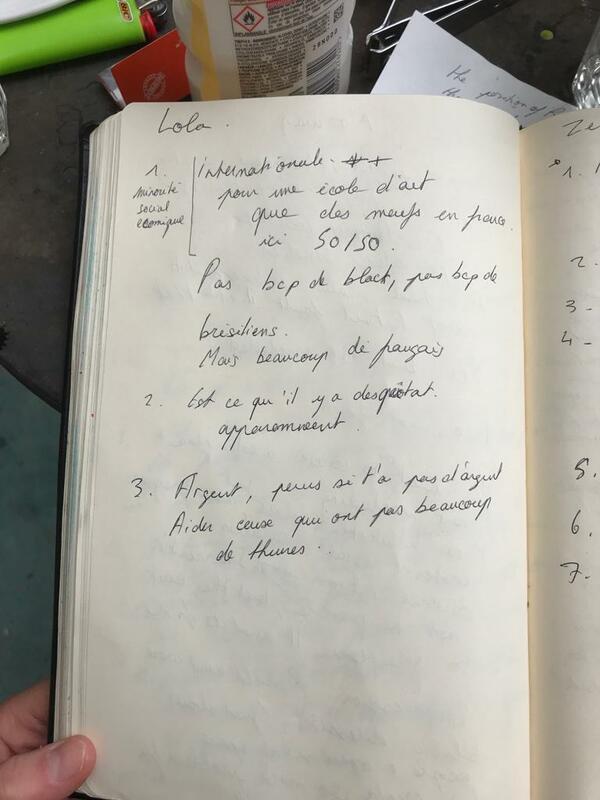 From 2016 to 2018 I did a bachelor in textile in ENSAAMA school in Paris. Some design teacher use to call our departement “napkin scetion”. Not safeplace or open minded attitude. I still had to figth for my work to be respected and all the departement was feeling like a minority in the school. I felt like in Rietveld I haven’t experience that or even had to think about my “female position” compare to the outside world, or just in Amsterdam for exemple. Why is that? 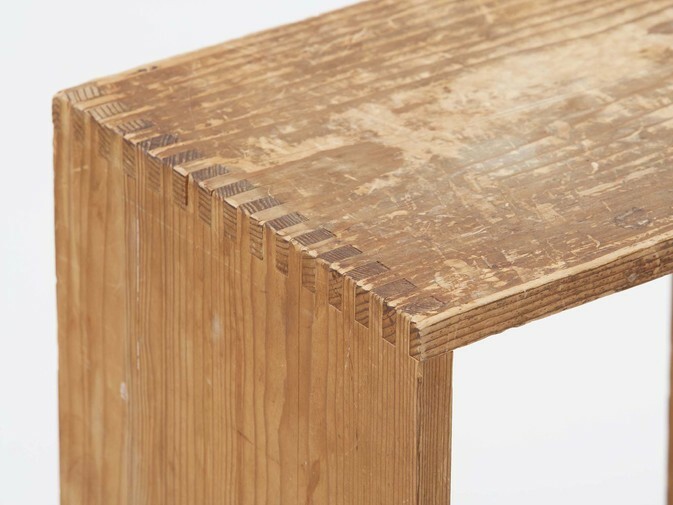 Is Rietveld a safeplace? For everyone? 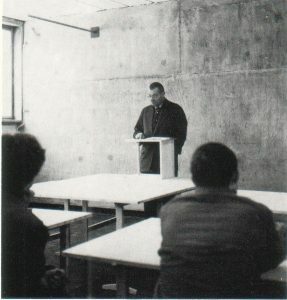 During the Studium General I noticed that the relation between Rietveld and minorities was an significant subject for the school. But I couldn’t really understand how they related to this. What minorities exactly? Why these one and not others? Is their a real issue or do they create the issue ? Or maybe their will always be an issue and the safeplace is an ideal. Is it possible to achieve to be the perfect open minded art school or will it always reject someone? 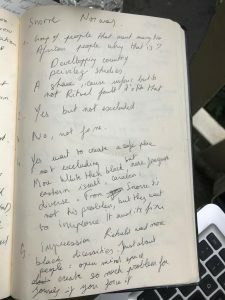 How long does it takes for a rejected minoritie to feel safe in an art school? And outside? What about the minorities inside the school? Quickly a thousand of questions came into my mind. I felt like if I was diving into an ocean of non resolving problematics. Then i asked to Mirjam the student concelor some of the questions below but she couldn’t help me and directed me to another person but I didn’t had an answer yet. How would you describe minorities in Rietveld? Do you recognize yourself as a minority? Do you see it as a problem? Is beeing a minority in the school is different then in the coutside? How according to you the school is involved in theses subjects? Are they some significant change that the school could impliment to improve the ‘safeplace’ for rejected minorities in art school? About redness in tea. green leafs that dries and take all ascorbic acid away with it, from rudeness that expanded into a settler colony, to a tea latte in a wine glass in jan evertsenstraat. an exploited small mountainous area in cape town , to the Boston tea party that made the biggest tea pot in the sea, I see myself enjoying the last sips of an endemic Fabaceae going to extinction by the time I graduate rietveld. if clarity is a key tea peculiarity, if metal doesn’t dander in the friction of an almost boiling glass, if the pinky in the air connotes elitism in an anti Bourgeois sphere, if tea cups are in maximum efficiency and simplicity, if the ottomans didn’t invaded the world, if the word design is aware of its meaning, not meaning, and if the cup handle is not a cup handle but an artificial cup hand. 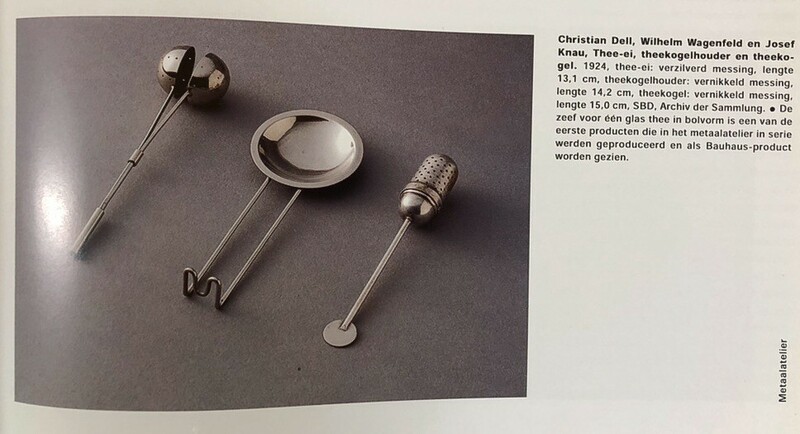 WHAT IF GROPIUS HAD THE ULTIMATE ROOIBOS TEA IN THAT TEA CUP? Would he have died in his sleep? I think I like transparency. Let them vandal aren’t we all damged. Ummm what does it tase like? it taste like you my love. Do you think it tastes like the future? oh wait, it taste like dancing in fields of yellow flowers on a midday, not so hot mid day. Do you taste the anxiety? it smells like their boots. she get dizzy every time she go down the stairs, then she forget what she was thinking about. A law of intolerable acts maybe to prevent making a tea pot enough for everyone. Is for everyone? where did you get the tea from? they go or not go to Cape Town, bring or not bring the herb, the red herb! Is it a flower or or another victimized commodity? Manner to not sip laud, a loud sip is to care less. does it depends on the cup, or a glass cup, or cups as glass. Lauder it was as an aquarium bubbling around tiny depressed fishes in a capitalist reality. They knew, fishes signed the petition, the petition was signed for an idea that was stolen from beyond and beyond the idea that was stolen there was an idea of a stolen idea, stolen from an idea that though it will never be stolen, there was the thief that stole the stove, the stove that they made the rooibos tea on, the same tea that he might drank while making that famous teacup, that same transparent love story that was broken after making a tea that was so hot, so hot that never a human drank it ever. A card is thickened paper and a paper is a thinned tree, how can we sustain if we can’t obtain alternation for consumption mania, fixating their future. Tea parties, tea breaks, smoke breaks, call them or not, They gather and discuss all what is so important and not, they assumed and forgot, we are the bitter, but what! It was early, early it was, coffee was wondering by herself on the table, on a sugary really sweet pink new paper publication sheet of paper. I poured, poured and poured In that sad paper not paper cup, and throw it in the ben, not so bin, plastic ben, aren’t we plastic bins anyway. Let us therefore create a new guild of craftsmen without the class-distinctions that raise an arrogant barrier between craftsmen and artist! Let us together desire, conceive and create the new building of the future, which will combine everything – architecture and sculpture and painting – in a single form which will one day rise towards the heavens from the hands of a million workers as the crystalline symbol of a new and coming faith. The ending paragraph from the Bauhaus Manifesto written by Walter Gropius and a quote from the Communist Manifesto. Animal Farm starts of with the animals dreaming of a better life, in which they are all equal and not treated as the means to an end, but like living beings with rights no different from the humans, who rule over them. When the opportunity for their dreams rises, they seize it and try to create a life and society where they all work and receive equally. The story is never specified as communist within the book, but Orwell has stated that it is an allegory to Russia, before and after the revolution in 1917 that then led them into the Stalinist era. This new society first flourishes and is enjoyed by most until one of the pigs, Napoleon, sees a chance to gain more power. He does so by constantly telling the other animals that this is actually what they want, that he is choosing to do and so in their service. Finally *spoiler alert* it comes to a point when the other animals cannot tell a human being from a pig, their “chosen” leader has become what they tried to escape and it seems like an inevitability that this should happen. 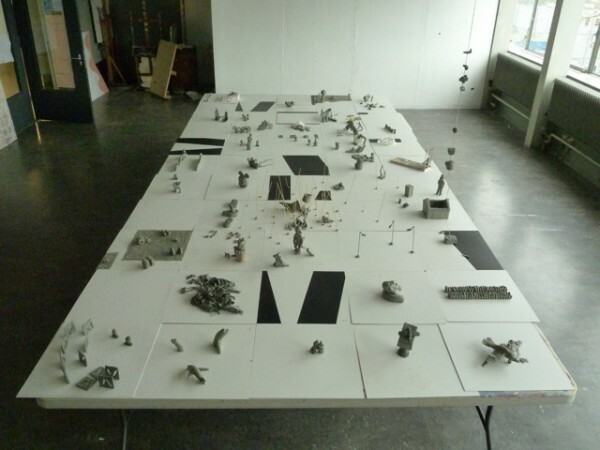 To me, at least, this bears a lot of similarities to how the Rietveld Academy functions. A way of showing and telling one thing, but then not fully living it. This can be seen in the departments, how openness and inclusivity is advocated, while in reality interfluidness can be quite hard to achieve as a student. 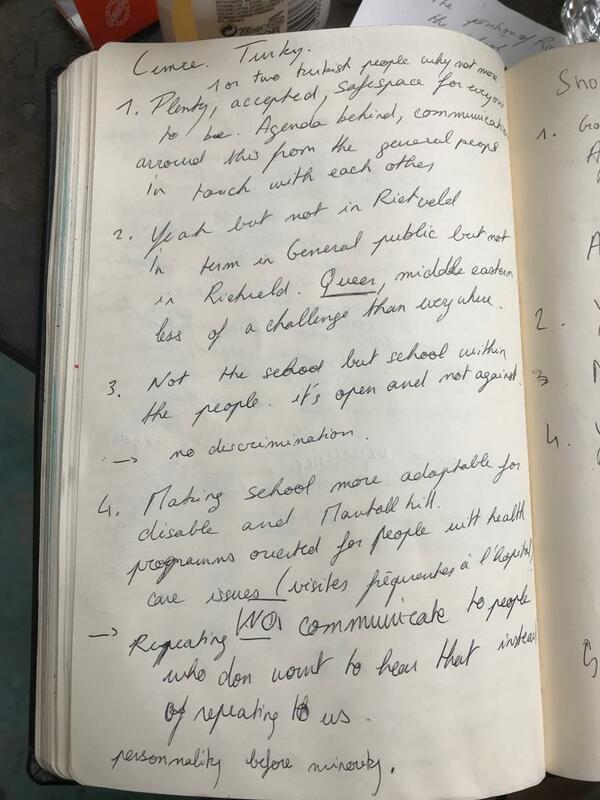 With classes only for ones own department (as in TxT), extremely long waiting lists for facilities (as in Glass) and very limited opening hours (as in Ceramics). 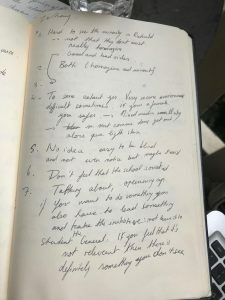 Of course complete freedom and total sharing is very hard to obtain, if not impossible, but should you then, as a school, really claim these traits? 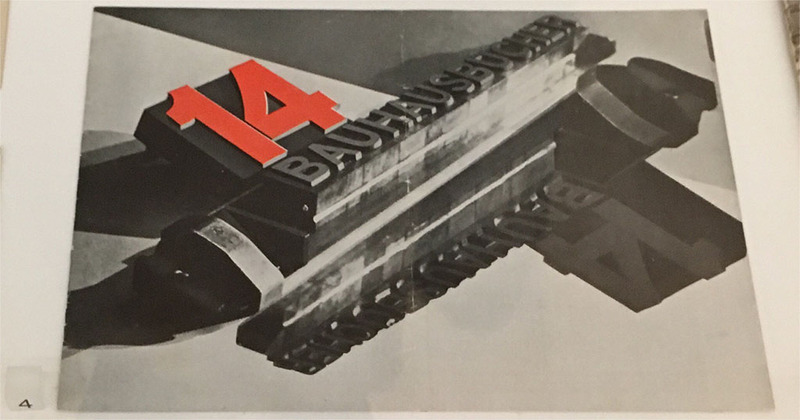 On the other hand, you could claim that TxT, Glass and Ceramics are some of the departments that actually live up to the heritage of the Bauhaus as they are somewhat material and technique based. In this context I feel it is interesting to bring up the subject of the Fine Arts department, as this goes against all the teachings in the Bauhaus. 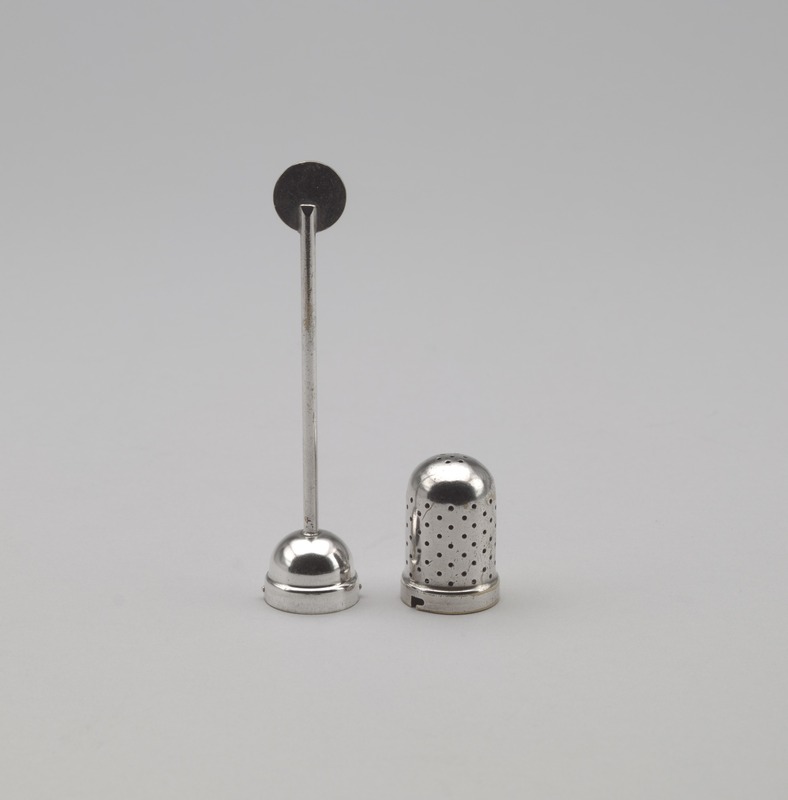 Creating just for creating, separating art from everyday life, from the craftspeople, from the non-artist. The fact that this is now one of the biggest departments at the Rietveld, can be seen as a sign that the Rietveld is becoming what the Bauhaus set out not to be. It was an animal, that turned out to be a pig and is now indistinguishable from a human. Or almost, at least. 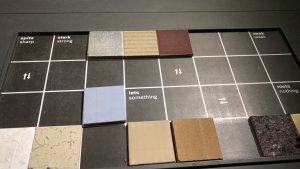 Finally, let us look at how the Bauhaus aimed to integrate art and life, to live with art, to build a gesamtkunstwerk, which is also very much apparent in their inclusion in arts and crafts – creating things that are not art for art’s sake, but are actually usable and meant to be used in real life. 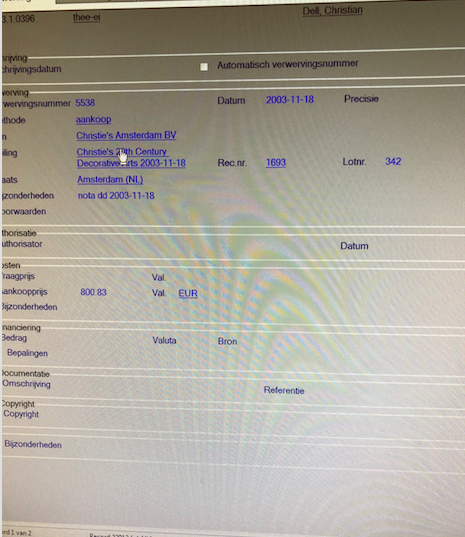 When paired with the exhibition netherlands ? 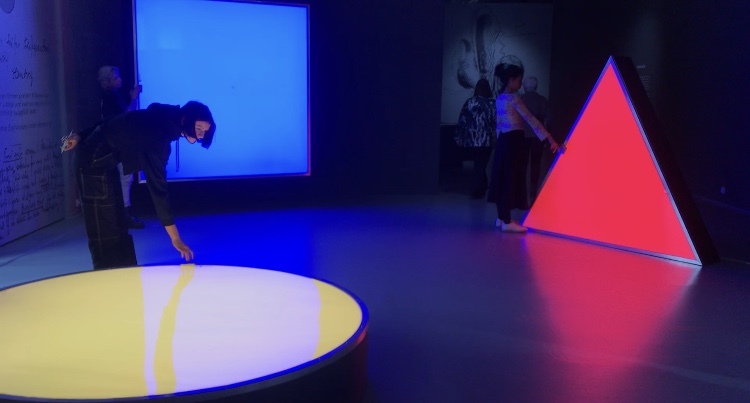 bauhaus – pioneers of a new world, at Museum Boijmans van Beuningen, it can be eye opening to see that something that was initially meant for use and created in a sense of togetherness is now showed in vitrines, where you cannot touch, feel, or try to use the work for its purpose. Is this exactly the opposite of what the Bauhaus was trying to do? 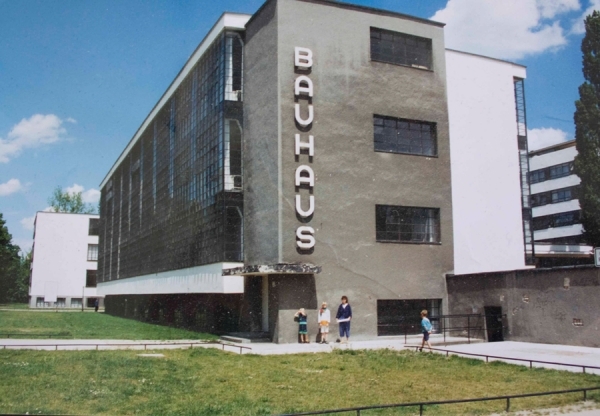 When I first heard “Bauhaus,” my first impression of it was just “big movement that is important in the history of European art” Because I didn’t have much interest and think it was not really related to me. 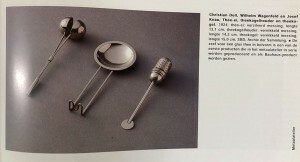 But Boijmans Museum’s exhibition of Bauhaus, where I went without any expectations, influenced me more than I expected. 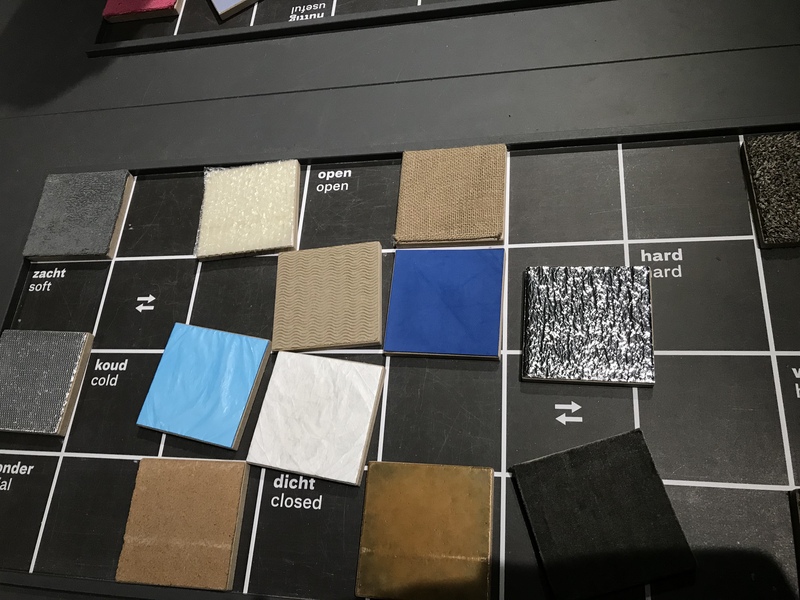 The systematic learning of basic things, such as materials and colors, seemed boring at first glance, but were the most dynamic and interesting things. Exploring the properties of materials, understanding the various and contrary things, geometric shapes and colors are the most essential elements for art, but I had missed them. 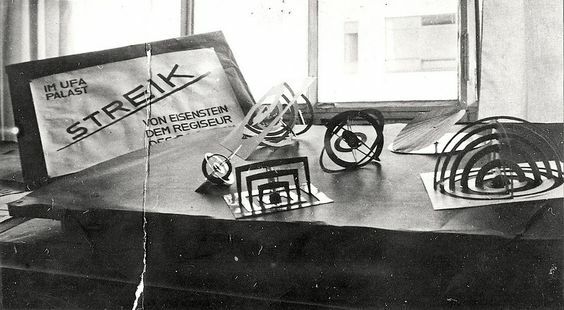 Through the writings of Johannes Itten, founder of Bauhaus vorkurs (preliminary course), I could understand exactly why Bauhaus put so much effort into these things. Let’s take a look at the works that I saw at the exhibition and the writings of Johannes Itten together. It was like playful work of children. It made me think differently about the concepts and the properties of materials that I had been knowing. Among the many exhibits, the drawings that caught my eye turned out to be from vorkurs works. 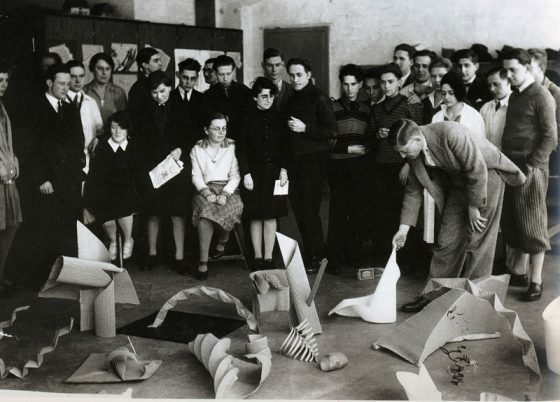 Johannes Itten’s ideals of education were very impressive and as a Gerrit Rietveld student, I related to that. Itten found it difficult to judge students because they all have different talents and characters. So the vorkurs was built, and students were able to have time to think fully about their interests and aptitudes as they went through this course. I think it is the same reason why Rietveld Academie persists in the basic year while many other schools have given it up already. 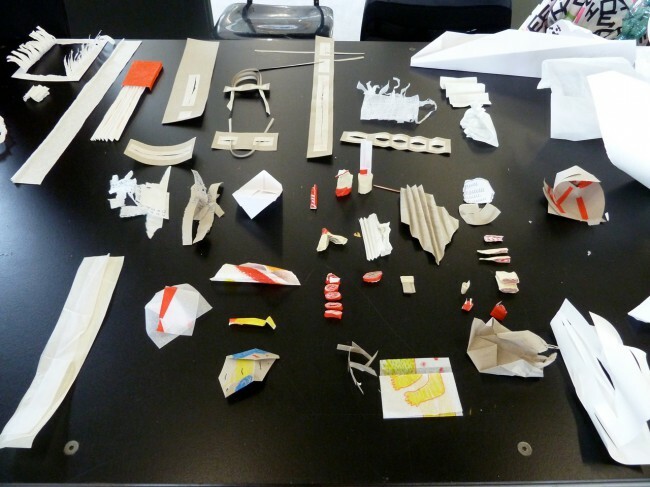 Students at Bauhaus had to explore and enlighten themselves without relying on the knowledge from the outside. 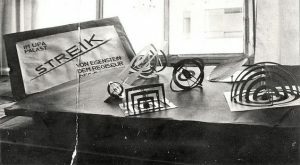 Itten emphasized inner growth and self-examination, so he went back to the quest for more basic things and helped discover students’ interests and talents through them. I felt lost when I came to the Rietveld Academie at first. I was used to Korean cramming education, that was why it was difficult and awkward for me to think about myself and being on one’s own. Of course, I’m used to them now, and this new way of education has given me a chance to think deeply about myself. Drawing and painting, theory, design, mixed media and sculpture, learning these five subjects, and using various workshops, I could see what I liked and disliked, or what I didn’t do well. The fairly free atmosphere of discussion and feedback also helped me broaden my horizons. Interestingly, you can find quite similar things. Both educations seem to be exploring materials. He thought the training the body as an instrument of the spirit is essential to an artist’s creativity. That is why, before attempting class, the students were asked to limber up their bodies and minds by physical jerks, controlled breathing, and meditation.5 I agree with his opinion as a yoga and meditation lover. I believe that the body and mind are connected and the brain also moves more actively when the body is ready and activated. Imagine, wouldn’t it be more fun and energetic if we did yoga together at school or if we did weird exercises before we painted? Maybe ‘Basic year’ is the most important time as an artist. This is because it is an opportunity to experience many challenges and failures without constraint. So far, I have been busy just completing my assignment. 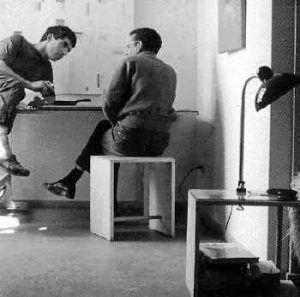 After learning of Bauhaus’ educational philosophy, I began to reflect on my attitude and to think about how to deal with my work in the future. 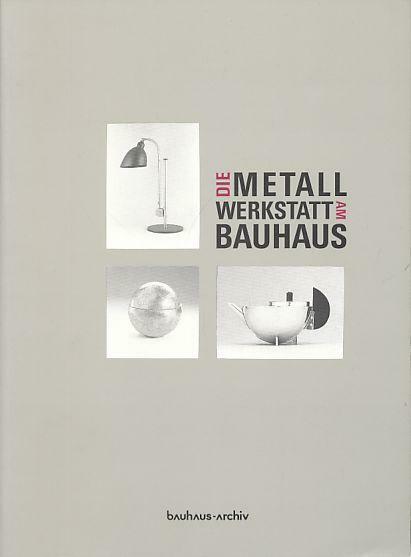 I will bear in mind the philosophy of Bauhaus, which is attentive to the sounds of body and mind, faithful to the basics and always exploring. If you walk into the Stedelijk Base exhibition, set up in the basement of the Stedelijk Museum, you will find yourself immersed in a forest of metal walls. Artworks, design objects and furniture are placed next to each other and sorted by theme or movement, rather than after the usual concept of a timeline. After a turn to the right and a subsequent turn to the left along the metal walls, the visitor (you) will find himself in the Bauhaus area, where you will immediately lay your eyes on a white, light woolen landscape hanging vertically from the walls. The name of this artwork is reliëfkleed, ‘relief rug’ in English, designed by the studio of the Dutch artist Kitty van der Mijll-Dekker. The first thing you will notice is the size of it; a sheer glance couldn’t cover the whole area of the relief rug. Reaching the top of the wall all the way down to the floor, the light beige, almost white color of this reliëfkleed blends wonderfully with the background wall. 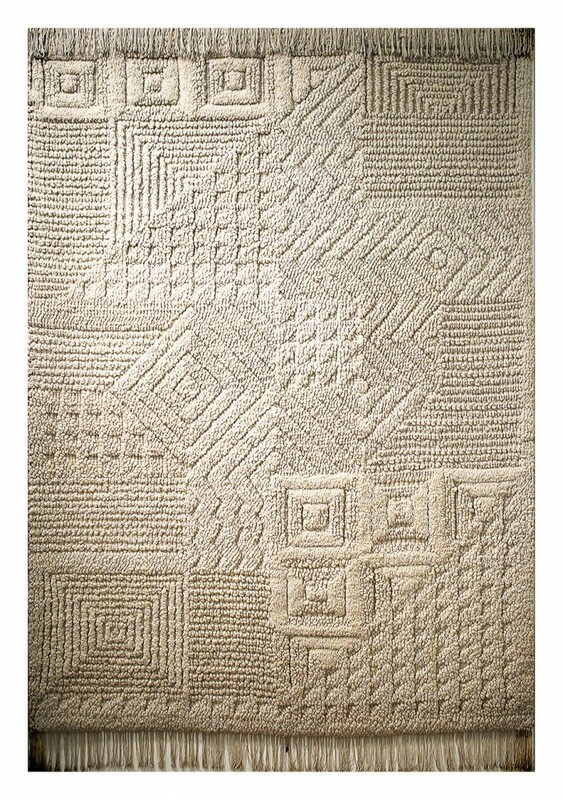 The rug is made out of differing techniques of weaving and knotting the wool, thus forming intricate geometric patterns. The second thing you will notice is related to the name of the relief rug: weaved and knotted, the rug forms an ocean of chunks, blobs and follows an intricate rhythm of geometric pattern. 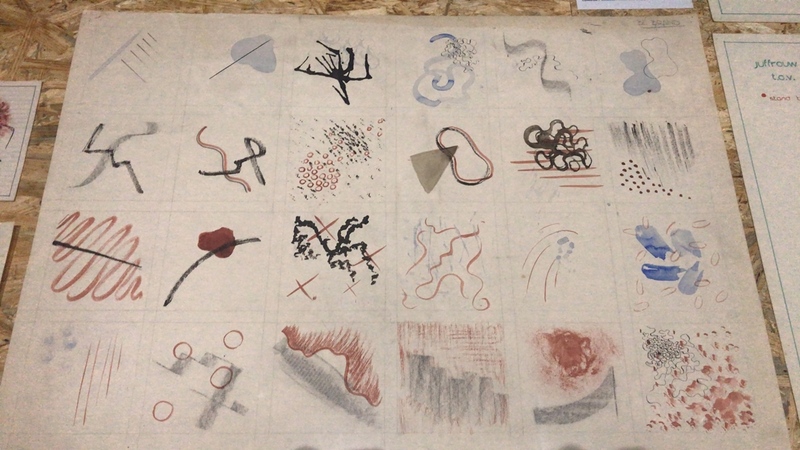 The relief rug was gifted to the Stedelijk museum in 1936, accompanied by handwritten congratulations of Willem Sandberg. 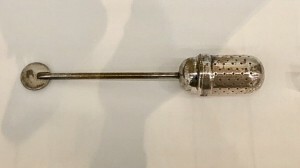 It toured the world exhibitions as part of the Dutch Pavilion in Brussels and Paris, not without receiving several awards. After the success of the relief rug, Kitty van der Mijll Dekker’s studio received invitations from the commissioner of the Queen to design and produce the carpets, wallpaper, bedding and the curtains for the royal provincial house in Maastricht [source]. Even despite her success with the studio, Kitty van der Mijll Dekker and her works are seldom mentioned on the internet. 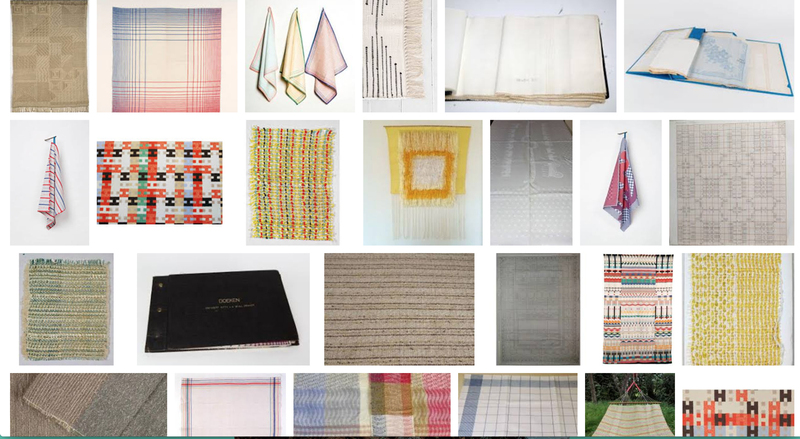 Try googling “relief rug” without attaching her name, you can find hardly any photos. The Bauhaus school in 1919 in Weimar. 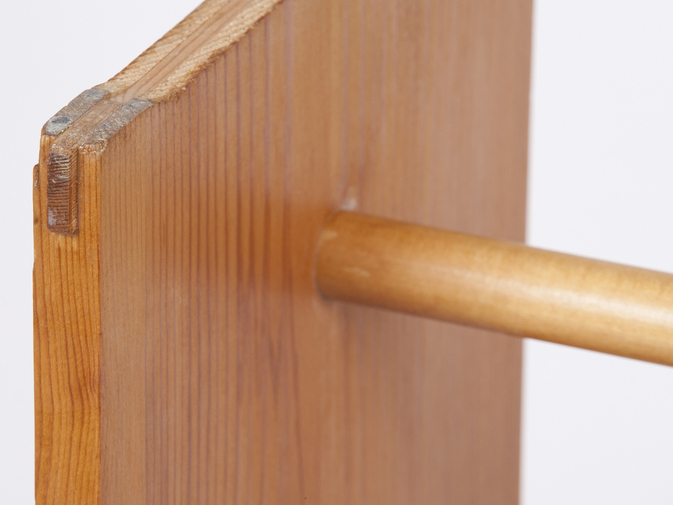 Walter Gropius founded the Bauhaus in 1919 with the idea of a modern, forward-thinking school in mind. For the first time, uniting real artistic practice and craftsmanship under one roof brings back the necessity for the “neue Baukunst” which translates into ‘a new way to construct’. 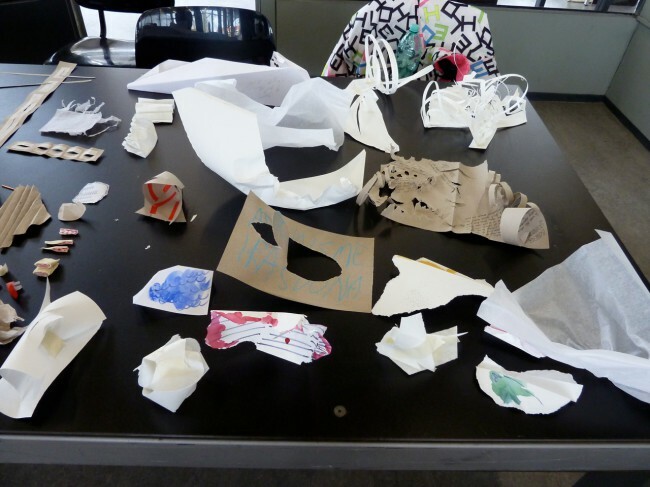 For this purpose, the Hochschule für bildende Künste (focussing on artistic practice) and the Kunstgewerbeschule (focussing on craftsmanship) in Weimar were merged together [read more here]. The formation of Bauhaus fell simultaneously together with the beginning of the Weimar Republic, in which women gained new rights, amongst which being allowed to vote for the first time and also attending university. 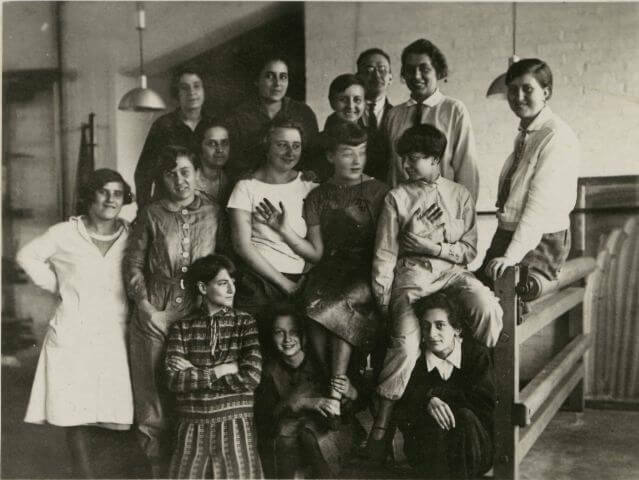 Women were more than welcome to attend school at Bauhaus, as stated by Walter Gropius in the beginning. 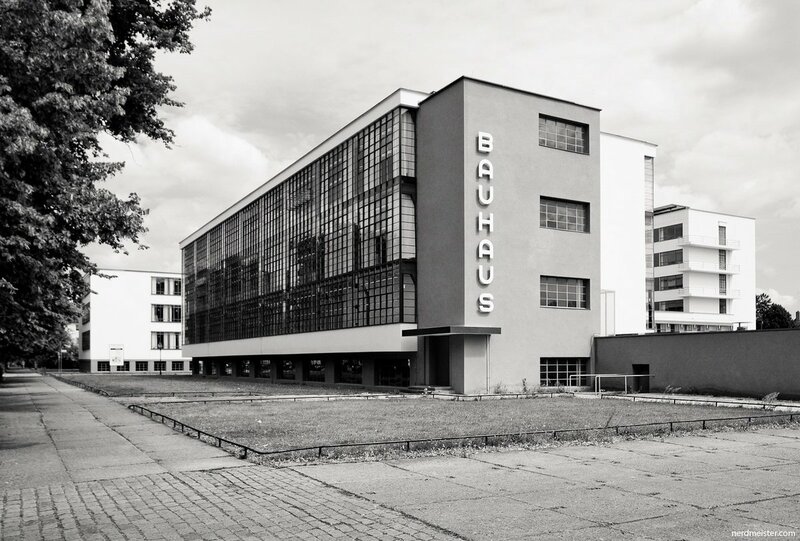 However, more women than men applied for Bauhaus once after it was opened, which lead to a drastic change in Bauhaus’ (and Gropius’) statements. 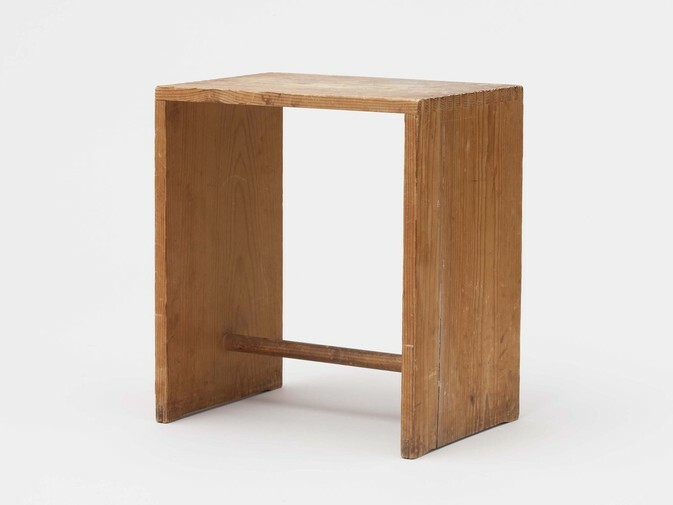 The large number of women at the Bauhaus attracted many forms of criticisms, including the complaints of the teaching bodies of the workshops, who are not used to have women work physically in their workshops. Traditionally, females are not allowed to be “Gesellen” journeyman, which students or rather workers who have completed an apprenticeship in a workshop are called. Wanting to set up his Bauhaus as a success, Gropius feared that his school might be denounced as a failure or taken not seriously if admitting so many female students, thus narrowing the admission of female students and setting up an all female class, which merged with the weaving department after a while. is one of the few female artists who succeed in the metal department, succeeding her male classmates. The weaving department, which also had few male students, was the space in which most female students were sent to after completing the ‘Vorherige Ausbildung’ our Rietveld Basicyear. Although the weaving department supported the school financially the most, it was seen as ‘less relevant’ or serious by the other departments. Other reasons, such as the philosophy of Johannes Itten towards the gender role or the increasing influence of the national socialists in Germany led towards a more backwards-facing behavior of treating female students than intended. 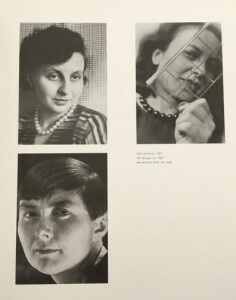 As a result, many female artists from the school of Bauhaus are under-represented or solely left out in literature or online. 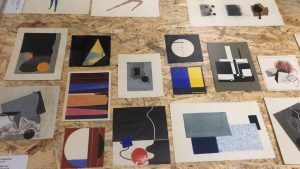 The solution would be a step-by-step collection of female Bauhaus artists and their works to make it accessible online for a wider audience, for example an open platforms such as wikipedia. 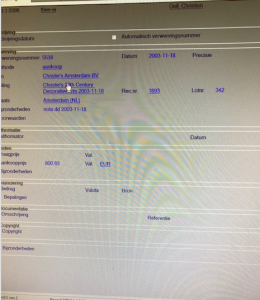 Kitty van der Mijll Dekker, born as Catharina Louise on Djokdjakarta (Java) in 1908, was raised as a child in a wealthy art-interested family of Dutch expats in Indonesia. 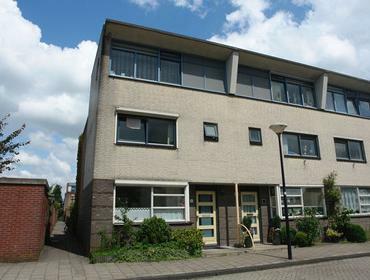 In 1916 at the age of 8, she and her family moved back to Den Hague in the Netherlands. Growing up, Kitty van der Mijll Dekker enjoyed educational travels to Switzerland and the United States. After studying art history in London from 1925-1927, she received private lessons in architecture by Cor Jarens. In 1929, she attends the vooropleiding of Bauhaus in Dessau and finishes her ‘Gesellenexamen’ in 1931 at the textile factory in Meschke in Rummelsberg, Germany. After receiving her diploma (nr. 66) on April 12th 1932 from Ludwig Mies van der Rohe and Lilly Reich, she returns back to the Netherlands and sets up the weaving studio ‘De Wipstrik’ with her former co-student Greten Fischer-Kähler and Hermann Fischer in Nunspeet. Greten-Fischer leaves the studio after two years, leading to the formation of the name ‘ Handweverij en Ontwerpatelier K.v.D. Mijll Dekker (Hand weaving and design workshop K.v.D. Mijll Dekker). This building is one out of a million examples of problematic contemporary architecture. A grey building in a grey country, no exciting materials used, no decoration, not any different from the next building, no ambiance created, no emotion left behind, no warmth expressed, no nothing. When I took a glance at the design books, my choice was clear rather soon; ‘Contemporary Architecture’. Admittedly, the contemporary architecture shown in in this particular book, which has an incredibly creative title for a book about contemporary architecture, is much better than the regular architecture you can see around you. 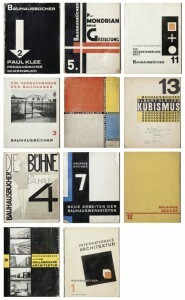 Yet it will never change my opinion that Bauhaus has stopped any evolution in the artistic field of architecture. How is it possible that in all fields of art, the artistic styles change so rapidly, while architecture looks almost the same for several decades? You can’t compare films from the sixties with contemporary movies. 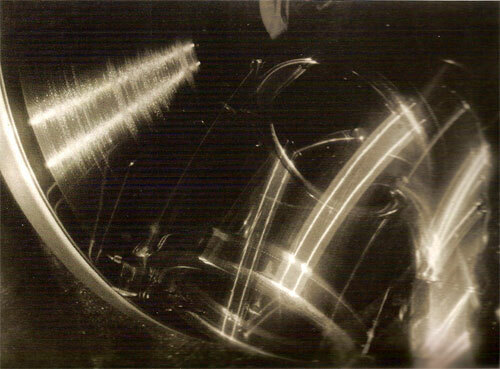 You can’t compare early photography with contemporary photography. You can easily compare architecture of the 1920s with contemporary architecture. 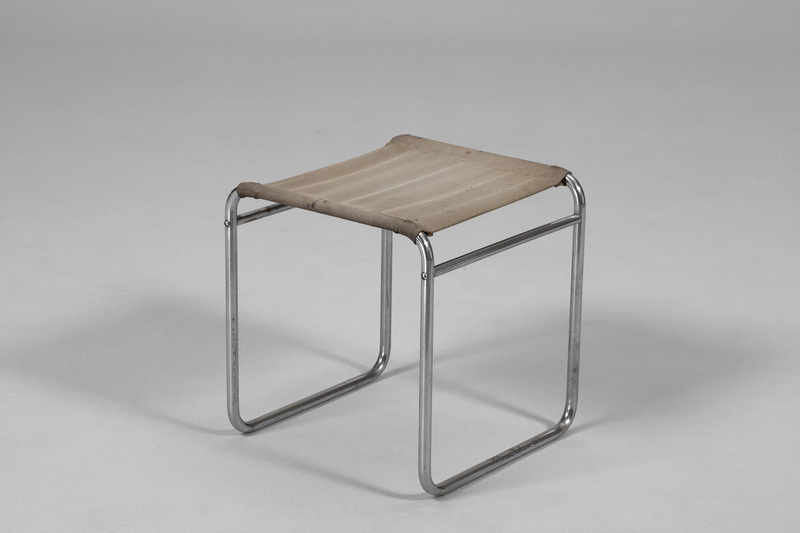 Why oh why with our modern tools do we still worship the rules of Bauhaus? Why do we fear decoration? Why do we need to make our homes so practical that we forget its real use: to feel home. Let’s face it; we are not living in a country where it’s a luxury to have a home at all, the use of homes in ‘our world’ is to feel at home. But no, we have to keep it gray, un personal, zero decoration. Do I have such an untrained eye or do all products of architects look the same indeed? Is it just what I see or are architects really so conservative? I’d just love to see architecture that acknowledges that a home is more than a frame. Let’s just make our homes our homes again, let’s stop those grey ‘machines for living’, those brick houses with their built-in BBQs, those average-man gardens with one tree surrounded by high anti-neighbour fences. 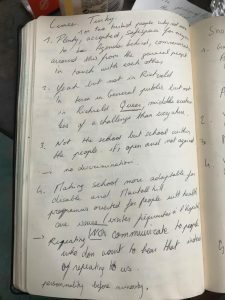 Ah well, I could probably have approached this subject in a more sensible way, with better arguments and all that, but hey, I am here to write a subjective article about the book that caught my eye – I can’t make it any more subjective than this. It’s time for a revolution though. Dear architects, grow some balls and be creative, not practical. 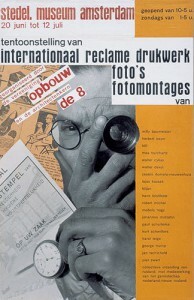 When I presented the designer I selected to write about to my teacher, and mentioned the fact that it was difficult to find information about him even at the libraries, he asked me to think of what made me chose Paul Schuitema and not one other of his contemporaries like Moholy-Nagy or Piet Zwart. Actually the answer is quite simple. When I first entered the exhibition I was very impressed of how the museum chose to present his work, as if it was a work in progress in his studio. The presentation consisted of repetition, cuts, different papers, drawings, different tryouts, and sketches, all very obsessive and concentrated, almost like a mechanical machine. 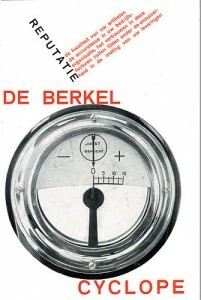 Of course, all of this made sense immediately as I read that he lived in the time of industrialization and mass production after World War 1 and was inspired and worked with the ideas of the Russian constructivism, the Dutch DeStijl, German Bauhaus and “New Objectivity”. But still, first I was a bit startled. 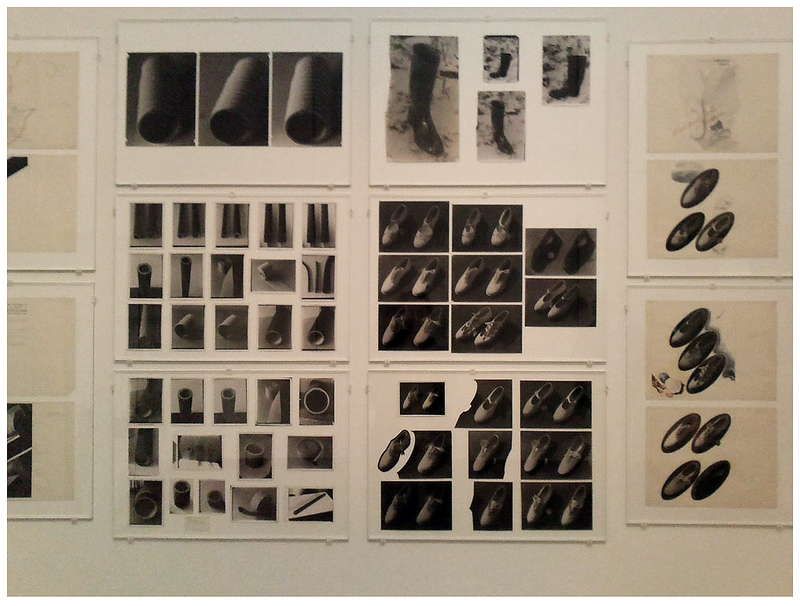 I tried to look for something else because I thought, like my teacher also said, that photography is as such an autonomous medium so in not very many cases it can be seen and understood as design. Than I understood that he uses images as “Applied or Useful Photography” – cutting and organizing them with pieces of text, creating a sort of collage for posters and advertisements – using the techniques and aesthetics of Graphic Design. I knew he had links with the Bauhaus and the “New Objectivity” movement and I found the names of the other better known designers of his time, but there was nothing mentioned about Paul Schuitema. Finally, after reading about all the theories from Weimar, I found some scanned pages from the english vesion of the book “Visual Organizer”. 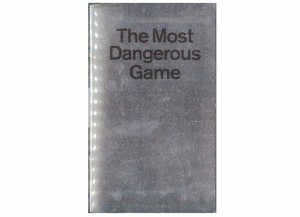 Soon I discovered that he was not only a graphic designer, but also a furniture designer, a photographer, and a typographer. He studied Drawing and Figurative painting at the Academie voor Beeldende Kunsten in Rotterdam. He was a member of Kurt Schwitters’ “Circle of New Designers”. 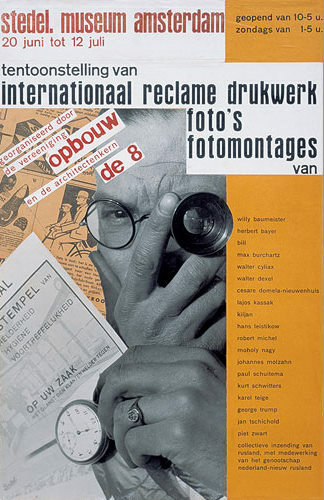 In 1931 he designed the poster for an exhibition at the Stedelijk Museum (which displays names such as Moholy-Nagy, Herbert Beyer, Karl Teige. 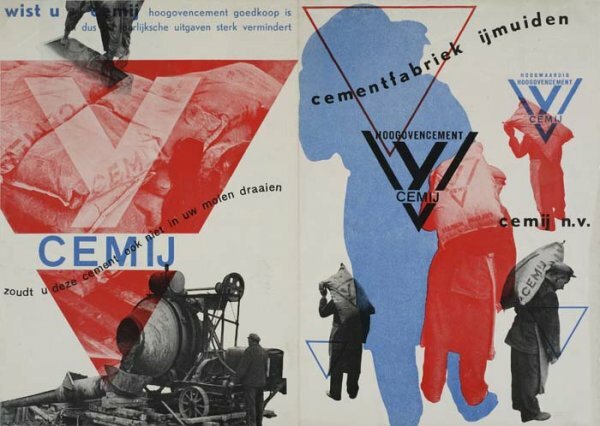 Lajos Kassak, Jan Tschichold, Piet Zwart, Cesar Domela and himself) and yet despite the seeming fact that in his time he was a well known advertisement designer, today people seem to have forgotten him. In the early ‘20s he had to perform building-jobs to support himself. This is the moment when he got in contact with the working class. This was soon to be a big influence upon his works. Berkel is mentioned as being the first who gave Schuitema the opportunity to work on graphic design. 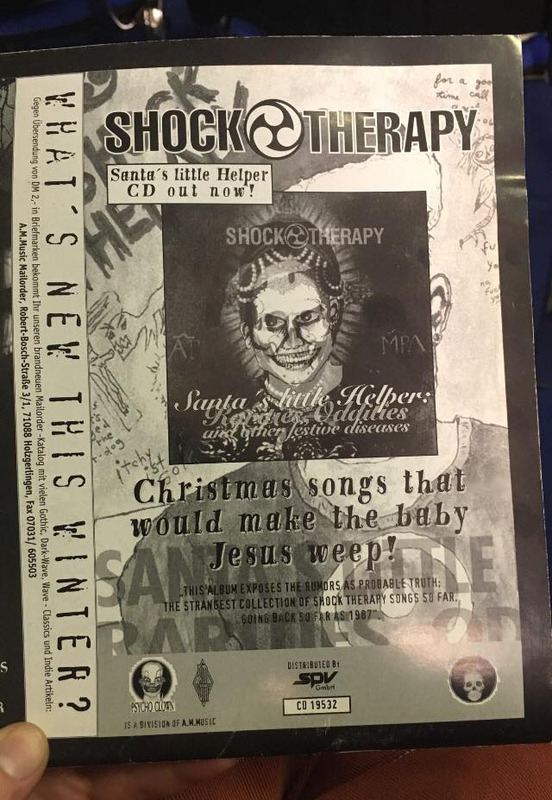 And here comes the moment when the photographs he uses becomes as important as typography in advertising a product. At first he worked with professional photographers, but because of their ‘artistic’ approach they couldn’t catch the simplicity of the subject as Schuitema wanted it, so he had to learn to use the camera, and all the techniques included, so he could get rid of the decoration and aesthetics and created his own photography. “If you become more of an expert yourself, and if you are also creative, your work will only get better” Schuitema once said. His contemporaries understood his wish to abandon any form of decoration in his prints, and saw his works becoming as sober and direct as he himself. Schuitema used the spatial effect of text by printing one on top of the other (only san-serif’s), simplicity, asymmetry and contrast such as horizontals, verticals, and diagonals, juxtaposed. Applying narrow, bold, small or big letters, mostly red, black, white, and sometimes blue, colors he managed to create dynamic covers. 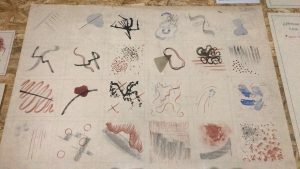 In relation to this process his images are not only illustrations or symbols or decorations, which accompany texts, but represent an organically linked body of work.